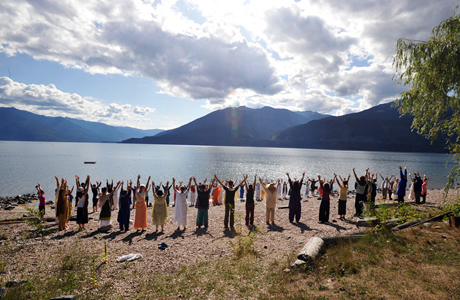 Today, more than 50 years after it was established, Yasodhara Ashram is an enduring and vibrant spiritual community. Set in the beautiful mountains of southeastern British Columbia, we invite people of all ages and backgrounds to pursue their self-development and discover the promise of yoga. As a Canadian charity and active learning centre, our purpose is to stimulate open intellectual and spiritual enquiry, supporting the potential of transformation in each person. We offer a wide range of yoga programs year round – from a three-month intensive, to private retreats, teacher certifications and introductions to yoga. Our popular Service and Study programs are for those interested in learning about Karma Yoga, or the yoga of selfless service, our main spiritual practice. Yasodhara Ashram is also a residential community, with a small number of full-time residents, swamis and brahmacharis who make our homes here. We are the stewards of Swami Radha’s teachings and the caretakers of this sacred space. We are joined in our efforts by many long and short term Karma Yogis, as well as teachers in training, course participants, guest teachers and retreat guests. We see over 1000 people pass through the Ashram in a year. The number of people living, working and studying at Yasodhara at any given time ranges from 50-120 people. Living with awareness in both the inner and outer worlds, Yasodhara Ashram is deeply committed to participating in sustainable environmental practices. From the Ashram’s perspective, environmental action is an important part of our social responsibility and ecological integrity, a practice of the basic yogic principle of ahimsa. With a lineage of leadership guided by women, our spiritual tradition emphasizes the nurturing and devotional qualities of the Divine Feminine. We are also home to the Temple of Divine Light, which recognizes the Light in all religions and the divine spark in each person. Our aim is to instill quality, care, awareness in all that we do, so that Yasodhara can truly be a spiritual home to all who come. Yasodhara Ashram is the hub of a network of urban teaching centres known as Yasodhara Yoga Centres, and the home of Timeless Books.